I grew up in Whittier, California and was educated in the California public school system from kindergarten through graduate school (except for a few years in Dutch schools in Heemstede, Holland). The three years I spent in Holland as a pre-teen had a huge influence on me and nurtured a burgeoning love of art. I was lured into the print shop in college by the music, the community and the technical aspects of the medium. I really have never left and continue to find inspiration, community and artistic challenges in the printmaking studio. I make prints, drawings and artists' books and exhibit them in the U.S. and internationally. My work is in numerous private collections and the permanent collections of the New York Public Library, the Boston Public Library, the Art Museum and the George J. Mitchell Department of Special Collections & Archives at Bowdoin College, Smith College Museum of Art, and Mortimer Rare Book Room as well as the Portland Museum of Art, the De Cordova Museum and Sculpture Park, The Hood Musuem, The University of the Arts (Philadelphia), Yale University, the University of Arkansas, Southern Graphics International Archive, Museo Internacional de Gravura, Alijo, Portugal, California State University, Long Beach Student Union Permanent Collection, Wheaton College Permanent Collection, Hampshire College Special Collections and the University of Michigan Art Library. 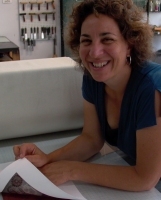 After years of teaching and museum work I founded Zea Mays Printmaking in Florence, Massachusetts, USA. As director and resident artist at Zea Mays I teach workshops at the studio and on the road at colleges and art centers. I direct the research program in safe and non-toxic printmaking alternatives. I lecture on safe printmaking practices and consult with artists and studio art faculty on the use of safer printmaking materials. I have had the good fortune to travel to many parts of the USA and the world to share my expertise and love of printmaking. I am a member of Society of American Graphic Artists, the Boston Printmakers, the Monotype Guild of New England, The Los Angeles Printmaking Society, the Southern Graphics Council International and an Honorary Lifetime Member of the California Society of Printmakers. When not in the print studio, you can usually find me in the garden, digging in the dirt.